THE NEWEST MEMBER OF LEUPOLD'S VX-R LINE OF HUNTING SCOPES IS the 4-12X 40mm CDS riflescope, and as the designation indicates, the scope features Leupold's excellent, easy-to-use CDS system. The new scope also features Leupold's FireDot Duplex illuminated reticle. CDS stands for Custom Dial System, and with it shooters can simply range the target with a handheld rangefinder and then dial the riflescope's turret to the correct distance, hold the crosshairs directly on the target, and squeeze the rifle's trigger. That's possible because customers send Leupold their cartridge's exact ballistics information, including their particular bullet's brand, type, and ballistic coefficient; their specific load's muzzle velocity; their installed scope's height from the bore of their own rifle; and the real-world environmental conditions (elevation and temperature) of where they typically hunt, and Leupold makes a customized turret cap engraved with yardages matched especially for the customer. The VX-R 4-12X 40mm CDS scope also features a 30mm main tube, a fast-focus eyepiece, 75 MOA of windage and elevation adjustment, finger-click adjustments of 0.25 MOA, and linear fields of view of 21.5 feet at 100 yards when set on 4X and 10 feet at 100 yards when set on 12X. The scope is 12.4 inches long and weighs 15.1 ounces. Eye relief ranges from 3.7 to 4.9 inches. And the finish is matte black. 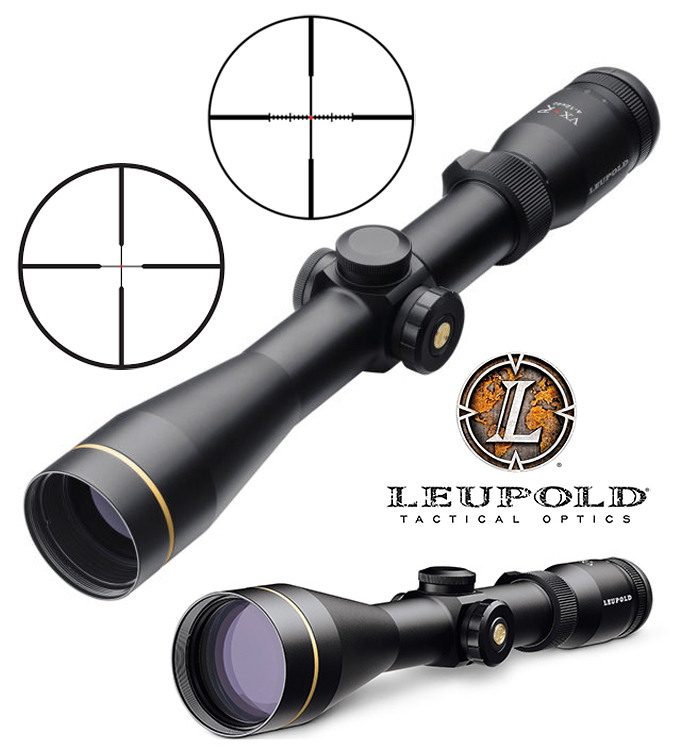 Leupold's FireDot Duplex illuminated reticle features an all-new fiber-optic LED illumination system and a patented one-button design that has eight intensity settings, a low-light indicator, and a proprietary motion sensor that automatically deactivates illumination after five minutes of inactivity and reactivates instantly as soon as any movement is detected. The FireDot's illumination system is powered by one CR-2032 battery. The VX-R 4-12X 40mm CDS scope is waterproof, fogproof, and shockproof. And it's backed by Leupold's Full Lifetime Guarantee, which means if your scope doesn't perform as promised, Leupold will repair or replace it for free, whether you are the original owner or not—forever (excludes electronic components). You don't need proof of ownership or a warranty card, and there's no time limit. The VX-R scopes were created to combine state-of-the-art optics; modern illumination; and sleek, rugged good looks. The new VX-R 4-12X 40mm CDS scope has 'em all. EYE RELIEF 3.7 to 4.9 in. FIELD OF VIEW 21.5 to 10.0 ft. @ 100 yds.